Will and I began our week by harvesting honey, This was actually the first honey ever taken from our Warre' bee hive! That meant we removed the top box, the first box we installed for our brand new package of Italian honey bees and our new queen, way back in April of 2012! They (our honey bees) decided to build their first box of comb on a diagonal and not follow the top bars with partial sides we had provided. They basically just did their own thing! Corn is normally pollinated by the wind . . . We had a "little helper"! See how full her pollin bags are? We couldn't go through the box frame by frame because our Little Pollinators had made quite a mess out of their first box! We smoked the hive, and removed the top box (which should have contained only their surplus of honey). The box ended up containing 2 diagonal brood-combs, along with several honeycombs. It was sad destroying bees in the larval stage, but we had to get their oldest box "straightened out", so to speak. Such busy girls . . . They are going for the nectar! 6 hours later: We had our first honey! I worked with food handler's gloves as I cut the comb from the box. Fortunately, I was only stung 3 times on my hands. When there is brood (baby bees) in a hive box, the nursery worker bees will not leave their post in the hive. The designer of our hive, Emile Warre', designed his hive boxes to be used by the common people. They are inexpensive, and relatively easy to build and maintain. The idea was to supply the bees with a hive that resembled the way they would build in the hollow of a tree. His boxes were smaller and made of thicker wood for better insulation against cold winters, with an attic to absorb moisture to keep the hive drier in summer and winter. He also believed "less is more". 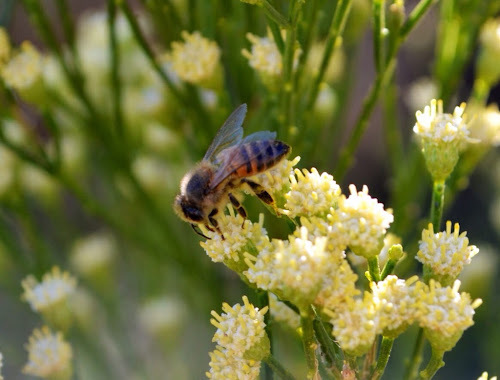 . . By leaving the bees to tend their hive undisturbed, except when harvesting honey, they were able to maintain the perfect temperature and humidity and better able to defend against disease and predators. Remember the wild flower seeds I planted way back in October 2012? The honey bees especially loved these Blue Bells! Honey bees were allowed to build their own honeycomb without the "help" of plastic forms, and pre-punched enlarged, comb, that most beekeepers use. This causes the bees to actually become bigger then God's original plan, making them more susceptible to varroa and tracheal mite infestations, because it takes an extra day to cap the bee larva. 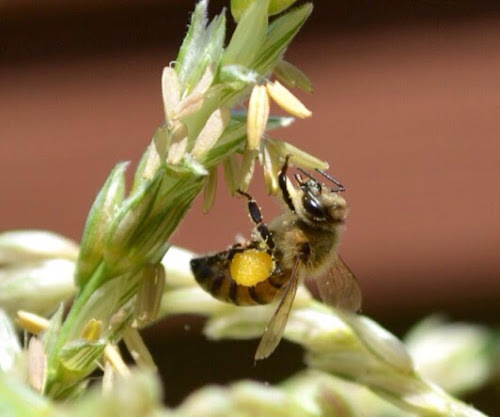 This type of beekeeping is a really good fit for the lifestyle we have chosen! 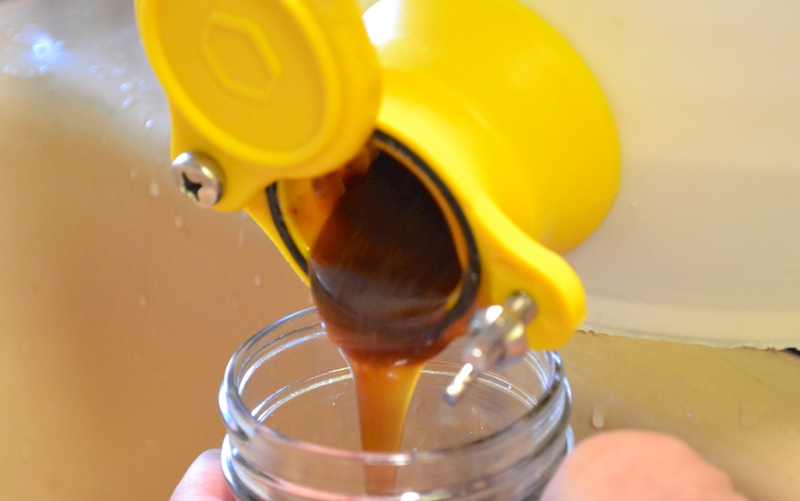 We use no chemicals in our hives, and that includes "organic" treatments. Just because something is "natural" doesn't mean it belongs in our hives, honey or our bodies! 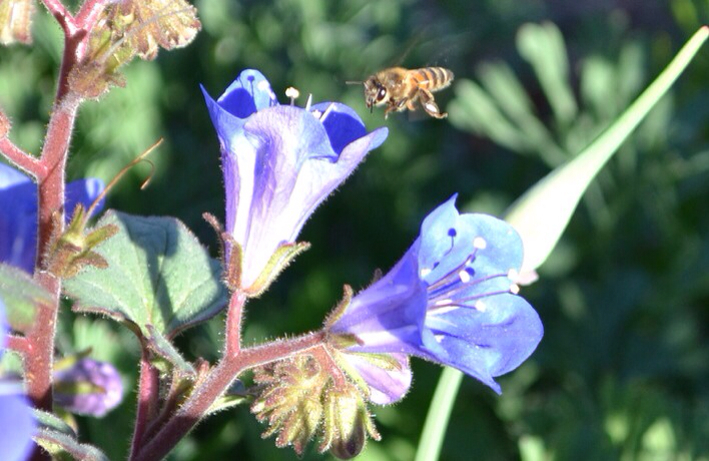 We chose our bees from stock that had been chemical free for a number of years and had a strong resistance to mites. Isn't she beautiful? That's why I fell in love with Honey Bees! Here at Over at Julie's we have tried to stay true to our "Making the Most of Every Day . . . With Homegrown, Homemade, Back to Basics". I can't even begin to tell you the thrill Will and I feel at becoming novice beekeepers, and finally harvesting our very first, of many batches of amazing raw honey! 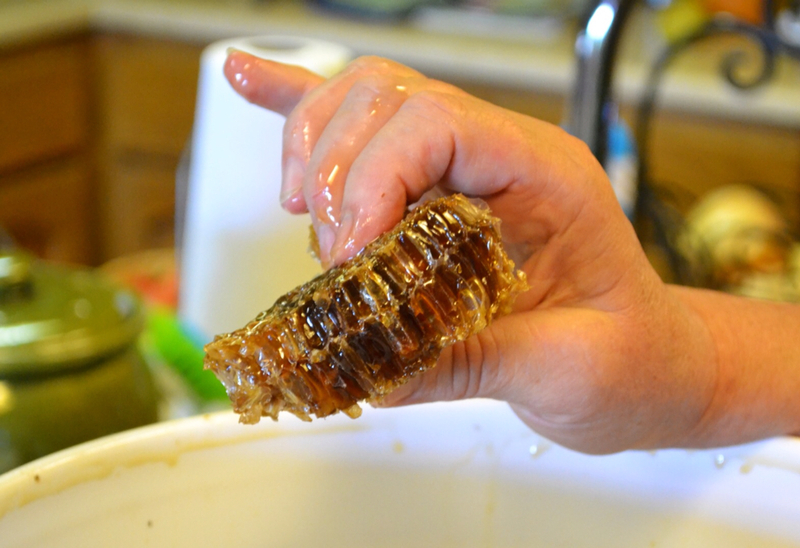 Our first harvest was quite small, but in the years to come, we hope to expand our hives and honey production. I am still absolutely smitten by the miracle of honey bees . 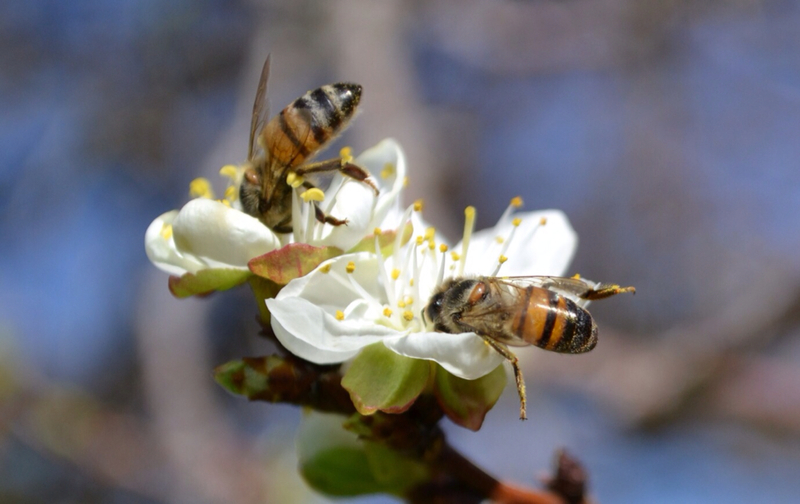 . . How they can remain airborn with such heavy bodies, pollinate our fruit trees, flowers, and garden vegetables, manufacture bees' wax, provide a healing balm for burn victims, and produce sweet, enzyme and pollen rich, delightfully tasty honey . . . ! I am so thankful to you, my many readers, for the privilege of sharing all my experiences . . . Over at Julie's!!! 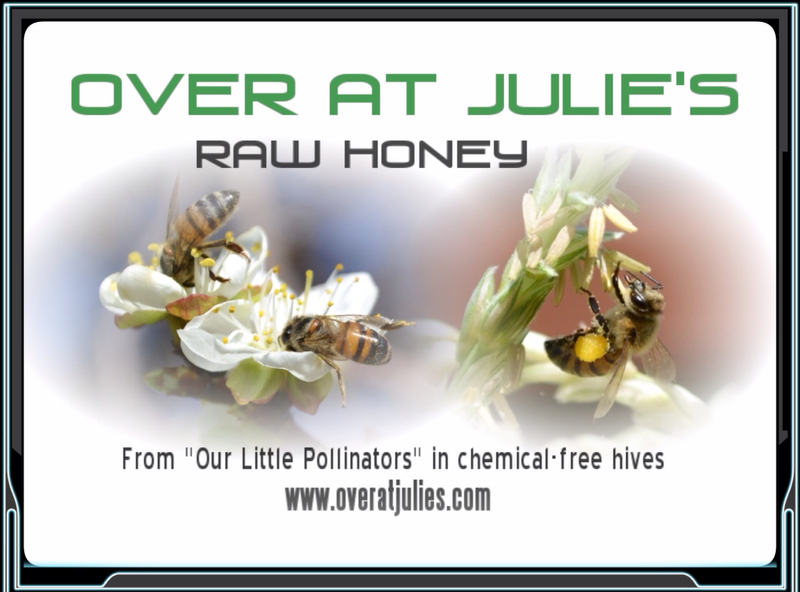 Label for our jars of honey with photos highlighting "Our Little Pollinators"!